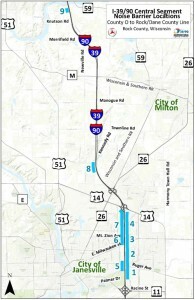 The Wisconsin Department of Transportation (WisDOT) will reconstruct I-39/90 from the Illinois state line to Madison. The project’s central segment extends from County O to the Dane/Rock County Line. 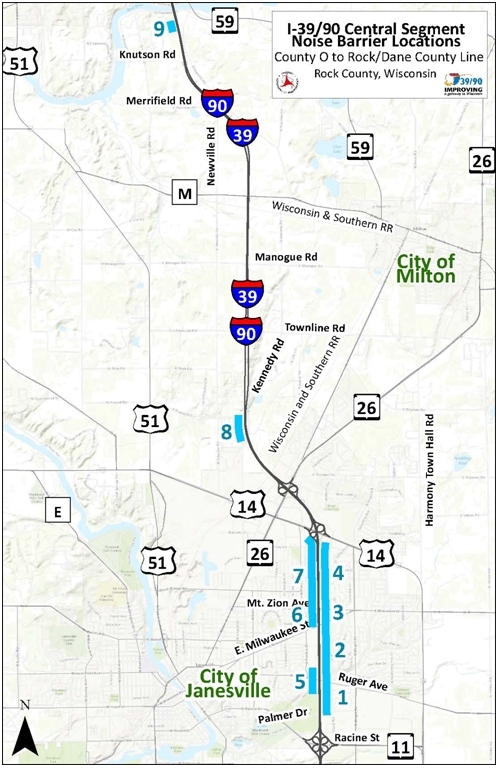 With the reconstruction and expansion of I-39/90, WisDOT evaluated the implementation of noise barriers throughout the segment and found nine separate locations where noise barriers are eligible. Voting for the nine proposed noise barriers occurred from mid-August to late September. WisDOT requested votes from the benefited receptors at each barrier location. The decision to construct a noise barrier at a particular location was determined by a vote of support by a simple majority of the property owners and the residents benefited by the barrier. To have been eligible to vote on whether a noise barrier should be constructed, your residence needed to be benefited by the noise barrier. A benefited residence must receive a minimum 8 decibel reduction in sound level as a result of the proposed noise barrier. Based on the ballots received, all nine noise barriers were supported by the majority of property owners and residents that cast a vote. The approved noise barriers are proposed to be installed during the 2018-2019 construction seasons. The types of noise barriers will be determined by the contractor awarded the construction contract. However, all residents can provide input on the noise barrier color and texture once a list of options is developed and presented at a future public information meeting. View more information on these noise barriers. If you have any questions about the project or the noise barriers, contact Derek Potter, I-39/90 Central Segment Project Manager, at (608) 884-7135 or derek.potter@dot.wi.gov.